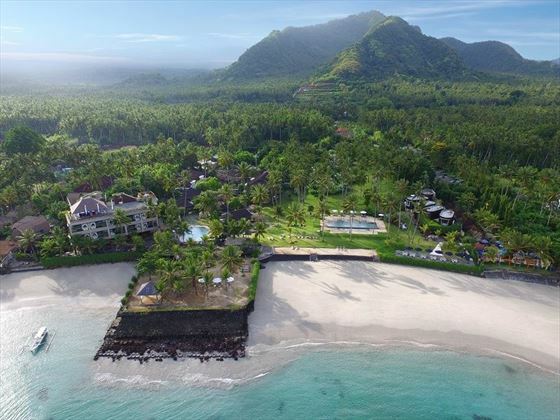 You'll find this secluded retreat on the quiet east coast of Bali, set amongst the sugary white sands of Mendira. 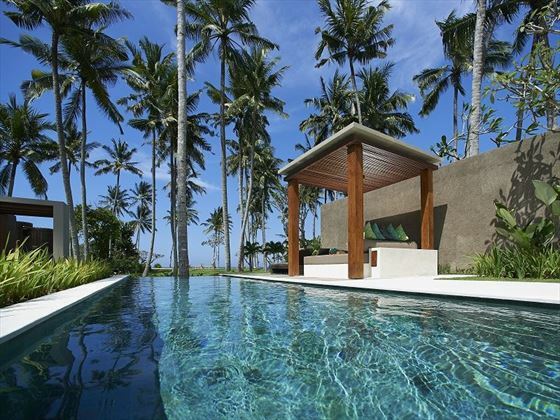 It's remote location is the perfect setting for a tranquil getaway to Bali's stunning coast. 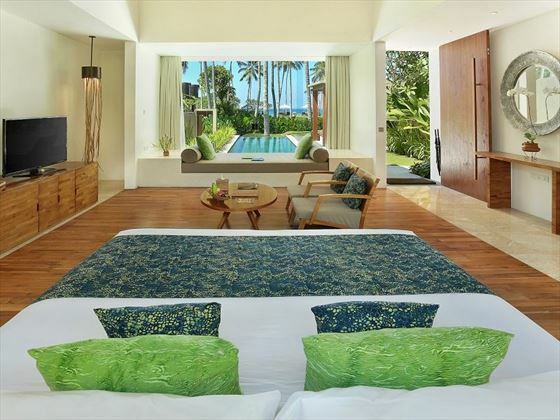 Appointed with a blend of Balinese and modern décor, these 30sqm rooms are located in the two-story west building, set overlooking the tranquil, luxuriant gardens. 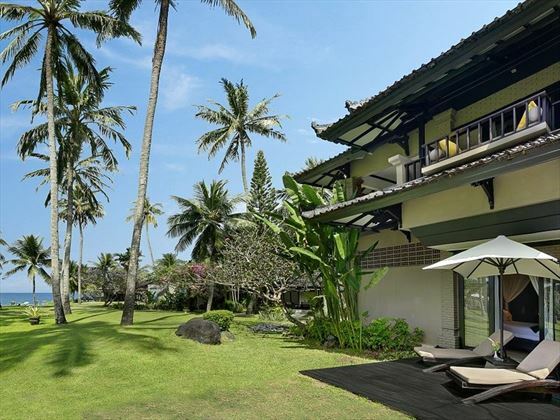 Located on the ground floor, these spacious, airy 30sqm bungalows boast gorgeous views and direct access to the luscious gardens. 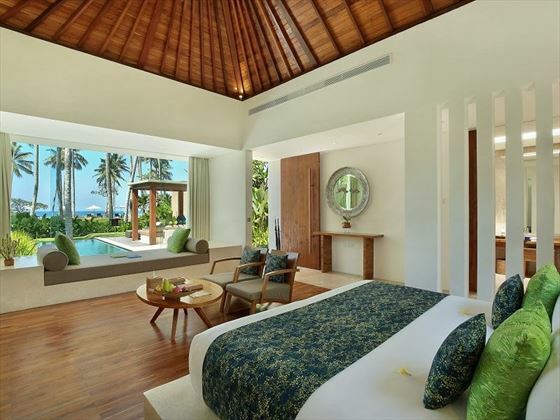 Located in the east building, these sumptuous 30sqm rooms showcase stunning views across the glistening Indian Ocean horizon and lush coconut garden. 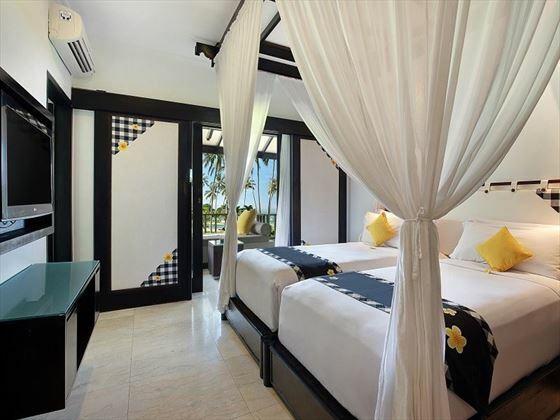 Luxurious and beautifully-appointed with stylish, modern décor, these 30sqm bungalows are located on the ground floor of the east building, boasting magnificent views of the azure ocean horizon and coconut groves. 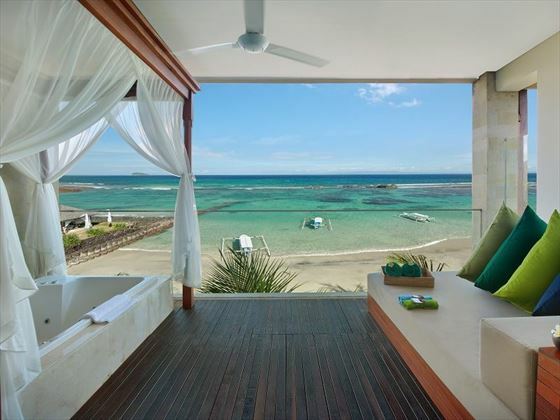 Decadent, serene and completely luxurious, these suites are the perfect choice for couples or honeymooners, featuring a heightened selection of pampering amenities, plush décor and an oversized private balcony showcasing spectacular panoramas of the Indian Ocean and Nusa Penida Island. There’s a total of 19 Luxury Pool Villas, hidden away from the main resort building for a heightened level of privacy and romantic seclusion. 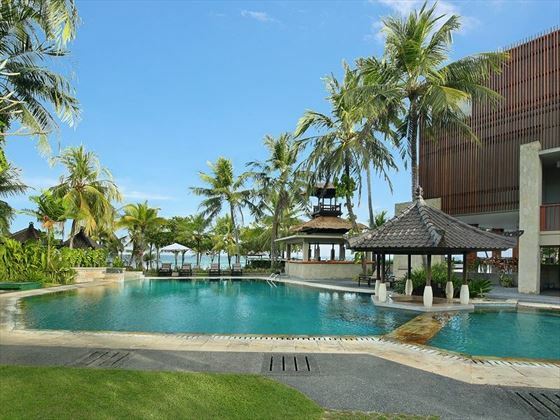 Spanning over 300sqm of spectacular, luxurious living space with a master bedroom, private ocean-facing garden, spacious living area and an abundance of sumptuous facilities to make your stay utterly incredible. 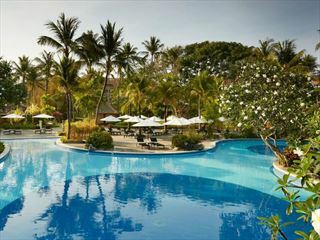 The resort’s signature restaurant, Biru serves a vibrant blend of locally-inspired Balinese flavours and Asian cuisine. 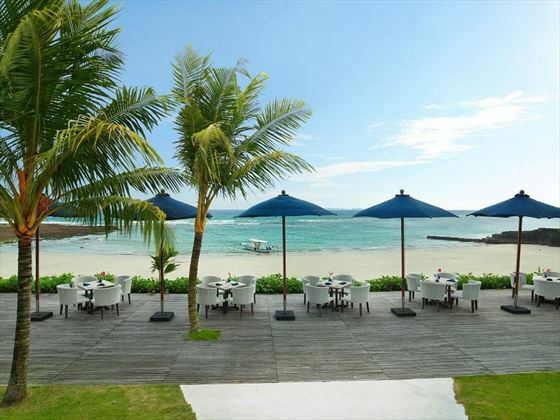 Sit back in an airy, elegant atmosphere, enjoy a delectable selection of refreshing beverages and mouth-watering food, and gaze into the incredible vistas of Mendira Beach’s clear, turquoise waters. 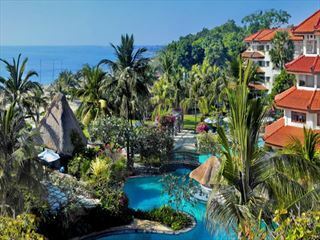 Located on the west side of the resort property, Ocean Terrace is set by the picturesque main swimming pool, showcasing awe-inspiring views over the Indian Ocean and Nusa Penida Island from an open-sided pavilion. Tuck into a superb range of classic western food for breakfast, lunch and dinner, and enjoy a casual, welcoming atmosphere. Offering a beautiful, scenic spot to sip on innovative tropical cocktails and mocktails, as well as a wide choice of local and imported beers, spirits and wines. 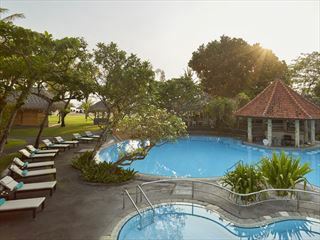 There’s also a great selection of tasty snacks to enjoy beside the picturesque swimming pool. 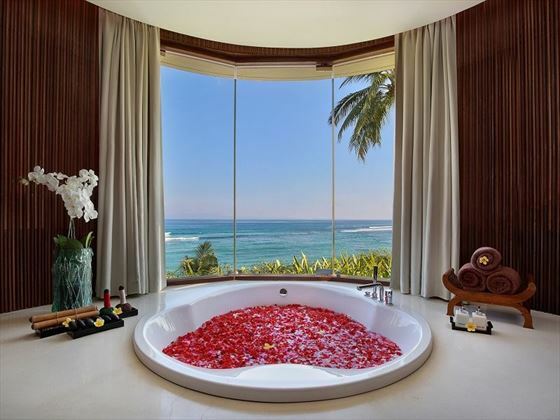 Enjoy a unique, special culinary experience within the privacy and serenity of your own suite or villa. Choose from a special created by the resort’s chef, and you will have the option to enjoy your meals inside or out on the villa pool deck; villas and suites also offer an a la carte or private dining option out on your pool deck, with the choice of a personal chef and waiter. Delight in a romantic, unforgettable dining experience with specially-crafted menus and a choice of gorgeous settings in the lush tropical gardens, on the beach or in a location of your choice.